Prior to TechyDad winning the Kindle Keyboard , I never imagined that I would enjoy reading anything that was not in a traditional book. Boy was I wrong! 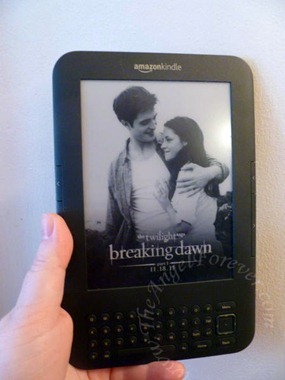 I do like holding a book with pages to turn, but the convenience of Kindle is huge. Kimberly allows me to carry many, many, many titles with me at the same time. I can have my books, items that the boys want to read, and TechyDad has a bunch as well. Talk about light and easy packing. See those “Get for Kindle” buttons? 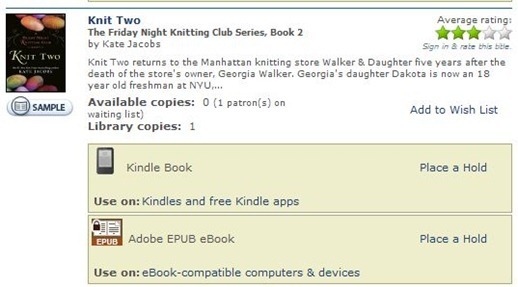 When you push those, it sends you to your Amazon account where it asks you to take them out from the library and sends them to your Kindle device. Yes, it is that simple. 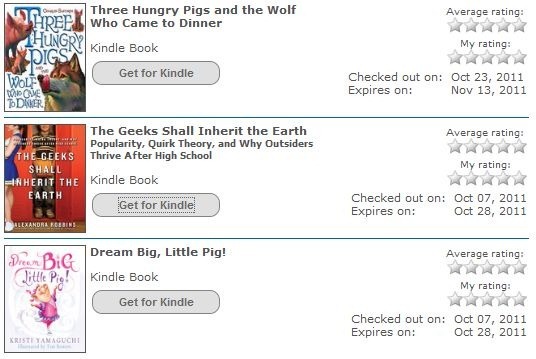 The next time you turn on your Kindle, the books download and you can start to read them soon after. The draw back with this is that the library seems to have a small amount of book titles and the new ones have a pretty long waiting list. In addition to this, you only get to borrow them for 21 days, not the traditional 28 days. I’m not sure if you can opt to renew if there is no other hold. We will likely check into that this week since I have not finished The Geeks Shall Inherit the Earth . Have you ever taken a library book out with your Kindle or other eReader? Would love to know your experience and what you think about it.